Otto Hans Ressler was a banker until 1978, when he took over the directorship of the Dorotheum in Graz. In 1986 he completed his training as an expert assessor and became the director of the art department at the Dorotheum in Vienna from 1986 to 1993. 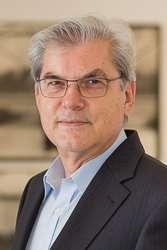 From 1993 onwards he was the managing partner of Auktionshaus im Kinsky GmbH (formerly Wiener Kunst Auktionen GmbH), which he had co-founded. 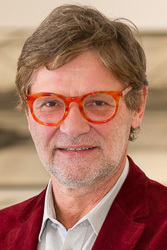 In 2011 he resigned from his post as managing director in order to dedicate himself to literature, and until 2013 continued as an expert for contemporary art at the auction house. Since 1997 Ressler has also been a general and court-sworn certified art expert. Apart from novels, he has published several reference books about art and its market: in 2001 Der Markt der Kunst (The Art Market), Böhlau Verlag Vienna; in 2003 Die Preise der Kunst (The Prices of Art), Böhlau Verlag Vienna; in 2007 Der Wert der Kunst (The Value of Art), Böhlau Verlag Vienna; in 2010 Das Mädchen mit dem Hut (The Girl with the Hat), Böhlau Verlag Vienna, a novella on the topic of restitution, and in 2013 the artist novel Die Gerechtigkeit der Hölle (The Justice of Hell), Edition Va Bene Vienna. 2014 saw the publication of Die Irreführung, a novel dealing with art forgery. In addition, he has written numerous contributions for anthologies, reference books, literary magazines and the ORF. Peter Coeln was born in Linz in 1954. He studied photography at the Federal School and Institute of Graphics in Vienna. He opened the world’s first Leica Shop in Vienna in 1991, founded the Rare Camera Company in London in 1994 and opened the photography museum WestLicht in Vienna in 2001. He is the director of the world’s largest auction house for cameras. In 2011 he won the Austrian arts sponsoring prize “Maecenas“. The jury wished to reward his special efforts and engagement on behalf of photography. WestLicht had already won an encouragement award in 2002. More than 300,000 people have visited the 70-plus exhibitions at WestLicht since 2001. The number of visitors is constantly increasing. With OstLicht, Coeln has added a second string to his bow, an enterprise specialised in contemporary photography. Mag. Markus Schmut attended the Akademisches Gymnasium (Academic High School) in Graz as well as a high school in Chicago. He then studied business at the University of Graz. 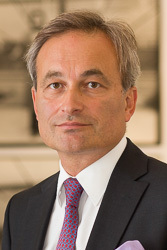 He held international positions within the Raiffeisen Group, focused mainly on Asia and Eastern Europe, and was subsequently responsible for the development of Deutsche Bank Vienna’s private banking sector in Central and Eastern Europe for seven years, ending in 2003. For three years, Mag. 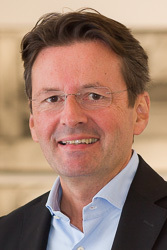 Schmut was the Director of Institutional Asset Management for Meinlbank in Eastern Europe. He was later Managing Director of Franz Adametz Financial Consulting GmbH and sat on the board of various real estate investment funds in Zug, Switzerland. In 2006 he founded the licensed brokerage firm Le Cap Financial Services GmbH, whose owner and Managing Director he is to this day. One of Le Cap’s close partners is Artportal Internetservices und Dienstleistungs GmbH, providing a link to the art market. Markus Schmut owns, directs and develops a group of companies dedicated to investment counselling and the art and real estate trade. He has collected art since he was a young man and initiated and directed the gallery for modern Eastern art “Galerie in der Sterngasse“, which looks back on many successful years. Valentin Basilides is married and the father of five children. His professional focus is on real estate project development, especially the renovation of older buildings and loft conversions using alternative forms of energy (pellets and solar technology). Furthermore, he is interested in promising, seminal companies. Since 2010 he has invested constantly in various Austrian start-up companies.